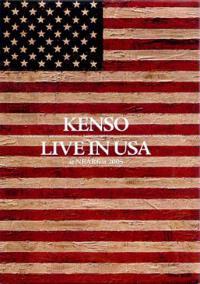 Kenso’s triumphant return to North America in 2005 at NEARfest left over 1000 people awestruck and blown away by their heady mix of symphonic rock and jazz-fusion. Nearly 2 years on from this legendary performance, a DVD documenting the show has been released via Japanese import. Live in USA is a multi-cam shot performance in 16x9 wide screen with LPCM 2.0 stereo sound. Sound was recorded and engineered by Brett Kull (echolyn) and produced by Yoshihisa Shimizu. The sound mix is excellent, with crisp high end, a crunchy midrange, and rounded, thumping bass that preserves dynamics without sacrificing presence. The video quality is very good as well...there were a variety of cameras used, and you can tell when one type of camera is switched to another, but generally this isn't distracting. As this performance was intended for filming, stage lighting has been ramped up slightly to allow for easier video capture, and the concert footage is a little bright. This is easily adjusted in the home, and does not truly constitute a criticism. Editing is also excellent; this is not edited in MTV style, with dozens of quick cuts per minute. If someone is doing something interesting instrumentally, the likelihood is that you are seeing it on screen as it happens. The performance was edited and produced by Kenso fan and associate Seikau Nolo, and his editing choices fit the performance quite well. From an overall standpoint, the set list performed at this concert was fantastic. As Kenso has not played many shows in North America (their NEARfest performance was only their second, I believe), the band made a concerted effort to select tracks that cover a wide range of releases and styles - fragile ballads, balls to the wall rockers, long compositions with symphonic grandeur...Kenso glides from style to style effortlessly. The band also took the time to showcase a few tracks that would be recorded and released on the group’s newest studio release, Utsuroi Yuku Mono. Each member of the group plays for the song, perhaps with the knowledge that there will be opportunities for an solo showcase, but knowing that the song always comes before individual attention. A number of special features have been added onto the DVD to complete the package. The classic rock medley mentioned above has its own entry in the special features menu. Oddly, the viewer is given the option to either watch the performance or listen to it, but not both at the same time. Thus, you get a black screen and music, or silent performance footage. Additionally, behind the scenes footage of the setup and sound check has been included. A brief section of footage from the band’s previous North American show (Progfest 2000 in Los Angeles), NEARfest 2005 post show party scenes (including a cameo from Gentle Giant guitarist Gary Green), and a photo gallery complete the DVD’s contents. From a video and audio standpoint, Live in USA provides great value for money. The packaging is excellent and unique. The band eschewed a traditional clamshell keep case, instead packaging the DVD in a custom cut heavy card case/tray. It's packed alongside a heavy card folder, with loads of tech notes in Japanese, as well as a series of 6 heavy card stock photo prints from the show, each with additional notes. These are all held in a neat clear plastic sleeve/wallet, which is silk-screened with the pertinent title/band information. It's a cool package, unique amongst my collection, and makes a great conversation piece.